Mon, May 29, 2017, 10:23 pm SL Time, ColomboPage News Desk, Sri Lanka. May 29, Colombo: Sri Lanka Foreign Affairs Ministry said many countries have come forward to offer support to Sri Lanka during the hour of grief, which claimed 180 lives due to floods and landslides. 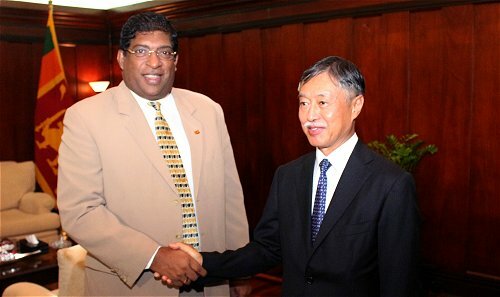 Envoys of USA, Japan, and UK met the Minister of Foreign Affairs Ravi Karunanayake this morning at the Ministry and offered their support, the Ministry said. Japanese Ambassador Kenichi Suganuma assured Japan�s support in many sectors and said that his country would provide drinking water filters, and power generators to the affected areas as soon as possible. A special relief team from Japan will also arrive here, he added. US Ambassador Atul Keshap said that the USA condoles Sri Lanka at this time and said that at any time Sri Lanka needs support, they are willing to give it. UK High Commissioner James Dauris while extending his country's condolences assured support towards Sri Lanka during this hour. Meanwhile, the General Secretary of SAARC, Amjad Hussein B. Sial meeting with the Foreign Minister also expressed his condolences to the victimized people. Minister Karunanayake thanked all the countries for extending assistance at this moment. The Ministry of Foreign Affairs in coordination with the Ministry of Disaster Management, has made an appeal to UN, International Search and Rescue Advisory Group (INSARAG) and neighboring countries to provide assistance to affected people, especially in the areas of search and rescue operations.